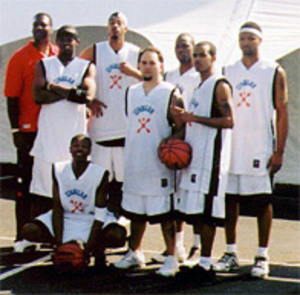 The Street Basketball Association was contracted to support the promotional and sponsorship efforts of Cingular Wireless during the hysteria of March Madness by creating additional marketing exposure and opportunities for Cingular during a one-month, ten-city tour featuring the SBA All-stars. The Cingular March Madness Shootout Tour brought basketball fans and enthusiasts throughout the U.S. together in a state of the art mobile arena with a regulation length portable street ball court with bleachers and stands, concert stage with DJ, basketball themed shooting games, video game and ring tone stations, custom airbrushing t-shirt booth, and the latest new Cingular phones, products, and services on display for sampling. The main entertainment attraction was the fan-interactive SBA Street Ball Expo produced and executed by the Street Basketball Association. Each city visited on tour was treated to a six-hour street ball expo consisting of slam-dunking and free-style dribbling demonstrations, shooting contests, fan interactive clinics, street ball show routines, autograph and photo sessions with the SBA All-stars, 3-on-3 competitions, and a full court 5-on-5-entertainment exhibition game featuring the SBA All-stars. The Street Basketball Association administered two SBA All-star Teams which each performed simultaneously every week in March corresponding to different March Madness Tournament sites as well popular college spring break destinations. The �West-Coast� SBA All-star Team traveled to Santa Clara, CA at the WCC Tournament Site, Los Angeles, CA at the Pac-10 Tournament Site, Lake Havasu, AZ during Spring Break, Oklahoma City at the NCAA Tournament Site Round of 32, and Albuquerque, NM at the NCAA Tournament Site Round of 8. The SBA All-stars for the West Coast were the following top SBA street ball legends: Andre �Silk� Poole, Pat �Da-Roc� Robinson, Rashid �7 & Sum Change� Byrd, Charles �Flat-Out� Ward, Sante �757� Gayle, Roberto �Exile� Young, Joel �King Handles� Heywood, and Jay �J-Boogie� Brantley. The �East-Coast� SBA All-star Team traveled to Columbia, Missouri for the University of Missouri versus Kansas game, Panama City, FL for Spring Break, Indianapolis, IN at the NCAA Tournament Site Round of 64, Charlotte, NC at the NCAA Tournament Site Round of 32, and Chicago, IL at the Navy Pier/NCAA Round of 8. 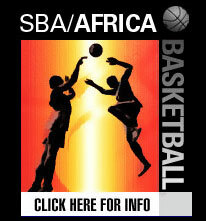 The SBA All-stars featured on the East Coast were: Malloy �Future� Neismith, Tim �Headache� Gittens, Greg �The Wizard� Jones, James �Swool� Rhodes, Zeke �Da-Freak, SuperNatural� Scott, Brian �X-Rated/Work Release� Mills, Dave �Dr. Dunkenstein� Bailey, Myron �AirBourne� Howe, Tim �Southern Comfort� Wells, and Shannod �JFK� Burton. Throughout the tour, the SBA All-stars put their reputations on the line being challenged by the top street ball players in each city. Both SBA All-star Teams went undefeated on their respective �East and West Coast� tours displaying some of the rawest street ball moves and un-matched explosive offensive abilities on the planet, proving once again, to their fans and their opponents that the SBA All-Stars are the best professional street ball players in the world. The SBA Street Ball Expo and Show Demonstrations produced by the SBA Sports Management and Entertainment Group is an entertaining �One of a Kind� marketing vehicle that can be utilized by corporate sponsors, promoters, basketball camp organizers, park and recreation directors, school administrators, coaches, teachers, police departments, Boys and Girls Clubs, YMCA directors, and other groups interested in using the SBA street ball product to help build character, confidence, responsibility, accountability, and a host of other qualities that will aid in personal, family, and community development to the youth in a fun and creative environment. The SBA Sports Management and Entertainment Group is a full service sports marketing and event management company primarily focused on the business of basketball offering turn-key entertainment events and sports properties. From the beginning process of event creation and planning, through full-scale management, operation, and production of the event, the SBA provides optimal solutions to maximize the value of the individual sports property. The SBA gives corporate organizations, both profit and non-profit, the ideal vehicle to penetrate the sports marketing arena as well as increase consumer awareness and create positive public relations for their products, services, and corporate mission.